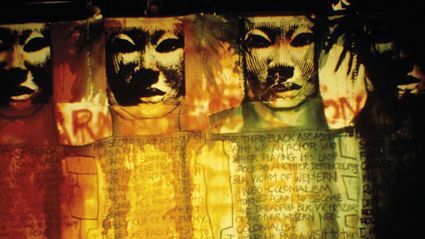 The Blk Art Group (formerly the Pan-Afrikan connection) was formed in the early 1980s by a radical group of young Black artists including Eddie Chambers, Claudette Johnson, Keith Piper, Marlene Smith and Donald Rodney. At a time when the Conservative government was outspokenly anti-immigrant, the British National Party was on the rise and the Brixton riots were shaking London, the Blk art group emerged as a creative force in Britain. The artists in this movement responded to the crises in race relations both at home and overseas by making work which was angry, defiant and thought-provoking. This exhibition will feature significant works by Rodney, Piper and Chambers which were acquired for Sheffield during the 1980s, but which have rarely been seen since, including Rodney's Britannia Hospital series and Piper's Black Assassin Saints. It will also explore the important role that regional galleries, including Sheffield's, played in supporting and promoting Black British Art at a time when many public art institutions were reluctant to engage with the political subject matter.